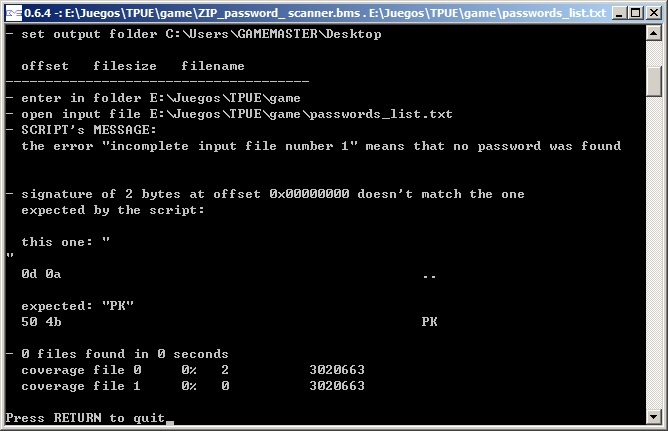 The following is probably the easiest way to retrieve the password used for the archives of some games, in fact it's quite common to find ZIP archives (sometimes with non-zip extensions like pak, dat) and protected by password using the ZipCrypto algorithm. This step is not ever necessary but it's a good way to avoid problems with packed/protected executables and games that built the password at runtime. 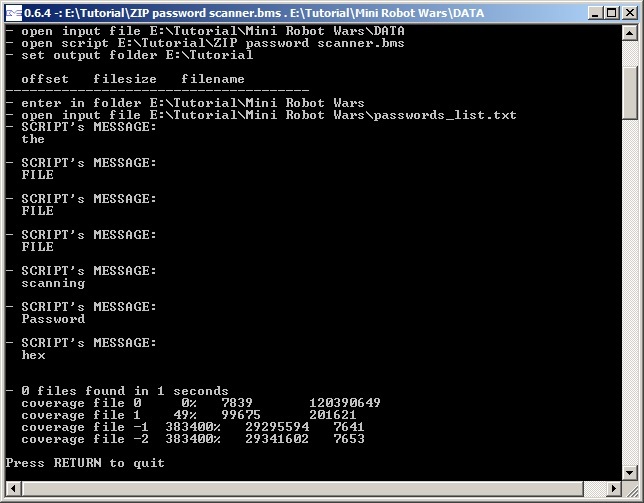 z:\>quickbms zip_pwd_scanner.bms "C:\Program Files (x86)\Mini Robot Wars\DATA"
- enter in folder . It's super easy, it requires no skills and works most of the times. Hello luigi many thanks for the great tutorial, I download this game for understand that, and really all be ok to the last step, and I stuck there, after run zip password script I got no password, all scanning going well but no found nothing so whats wrong? There is something really very strange in that message, it looks like your script is corrupted. The reason is simple, your messages are truncated so the password was found but you cannot see it. ok so now all be working fine, I redownload script and work very well, now my question is, I try it in another game, I got all files but in the end I got it, thats mean the password is not stored in .exe? PS: about the dump.dat the only way to dump this one to convert to txt password dump is via strings, because exestringz for some reason when try dump it it only stuck there in console like dumping, but it never ends. The image you posted show that you selected passwords_list.txt as input file which is wrong, you must select the ZIP protected by password as input file (passwords_list.txt is loaded automatically by the script). but when I re-importing (using awem.bms) always failed. I try open that .pak file with peazip always ask for password. may i ask to you guys to retrieve password for this game (resources.pak), or make a script for re-importing? thanks for a link, and i have check for Cradle Of Rome 2 [resources.pak] not found. You made a big mess and you are 100% OT. resources.pak is a AWEM archive that you correctly extracted with my script. If you extract the files in the same folder of the game, delete resources.pak and run the game, it may work. "If" it doesn't work then you can try the reimport feature of quickbms. If the reimport feature doesn't work correctly or you are not satisfied with it (it has some limits unfortunately) then there are no solutions ready to use. In this case the script is not valid for reimporting. Anyway this is TOTALLY unrelated to the ZIP files of this topic, so do NOT post here. whaaaaaaaaa thanks you very much, I will try that trick..
Yeah, you have to use alternatives for 64bit processes. The Windows Task Manager (taskmgr) has a "Create Dump File" when you right-click on a process in the Processes tab, the dump is big but it's perfect for your needs. Process Explorer has a similar feature with the additional possibility to create a smaller dump that probably doesn't contain the key you need, so you have to use the "Create Full Dump" option. The full dump is useful if the key is generated at runtime instead of being hard-coded in the executable. There are many tools that allow to dump only the main module of the process and not the whole memory without attaching debuggers, feel free to search on Google. How to do this with an android game? My dump file size is more than 3GB then when using exestringz I have an error Not enough space. How to do his for Mac? I need password for btd battles 4.8.2 for Mac! Please Help. I am loading the passwords_txt and everything, it scans, but it doesnt say it couldnt get a password or anything. It goes straight to the "files found". Thx! Ok this is confusing me when i launch dumproc i cant specify the game because it closes immediately am i doing something wrong? and when i get a dump dat using windows task manager the file size is 0 bytes which makes no sense please help. The reasons behind dumproc may be two: process is "protected" (anticheat and so on) and/or is 64bit (dumproc is 32bit), probably both. Try Process Explorer launched as Administrator, select the process, "Create Dump" and try Mini dump first, Full dump may be better in some situations. dumproc should be no longer used.